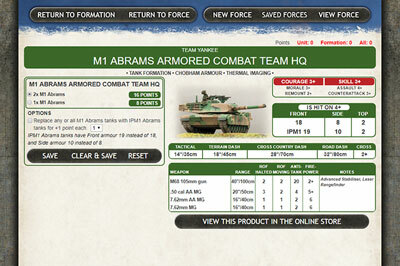 For many years people have been using Forces, the company builder for Flames Of War. We are now excited to announce that it is available for Team Yankee! 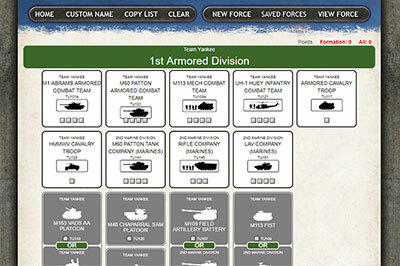 Because Team Yankee (and V4 Flames Of War) work a little differently to previous versions of Flames Of War, there have been a number of changes made to how Forces work so even you veterans should take a few seconds to read this basic primer. 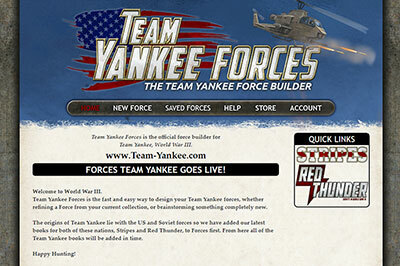 From the home page you can create a new force, check out your saved forces, head over to the Team Yankee online store. 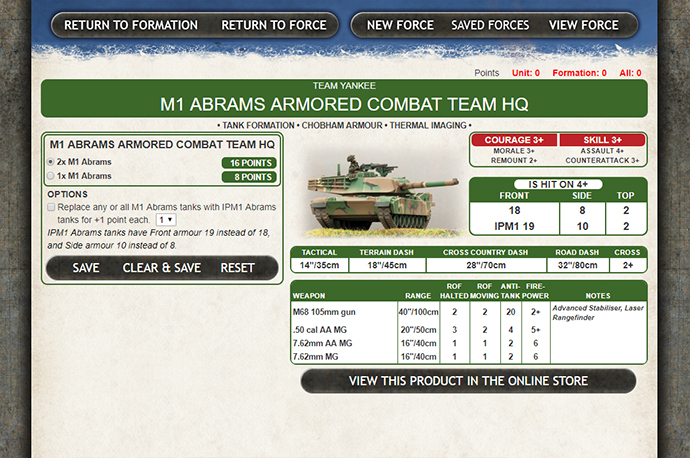 Click the quick links on the right hand side to quickly start making a new Force. 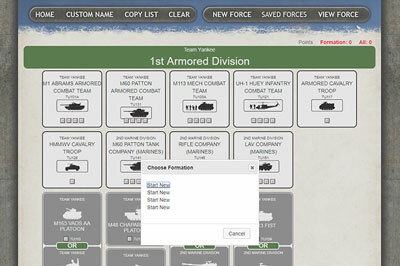 Unlocking Formations in the builder cost $1USD each, although if you purchase 5 (or more) you get a 25% discount. 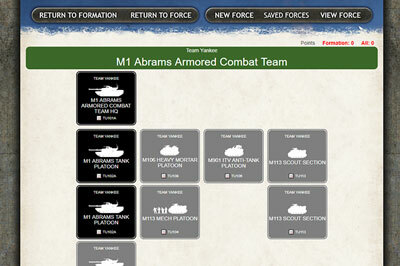 Once a Formation from a nation is unlocked the Force Support is automatically unlocked too. On the Force page you can select the Formation(s) you wish to build, as well as checking out the range of Support options available to you. 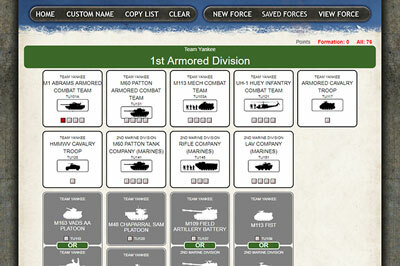 To begin building your Force just click on one of the Formation icons, then select Start New. Pick the options along with any upgrades that you want, then click save and either Return To Formation if you want to keep adding options to this Formation, or if you are finished and want to add a second Company you can click Return To Force. 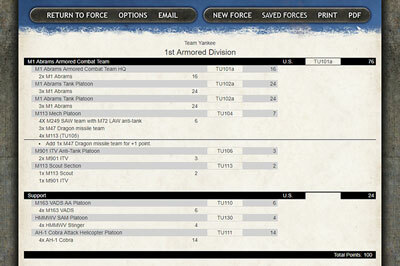 Select the Support options to finish rounding out your Force. 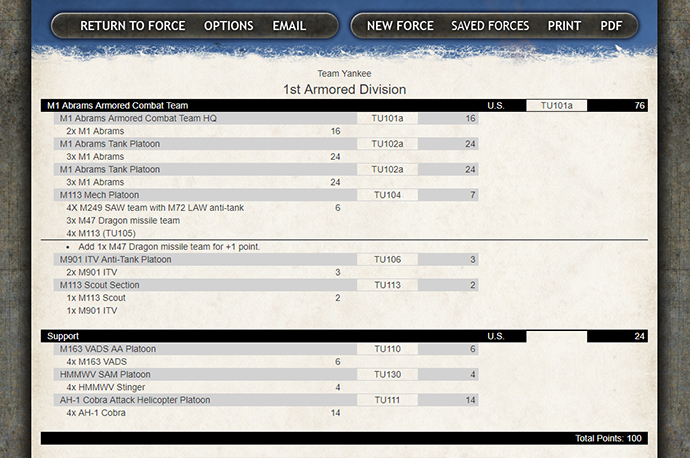 Now you can save your Force for later or create a handy printout of PDF to take to your next game. 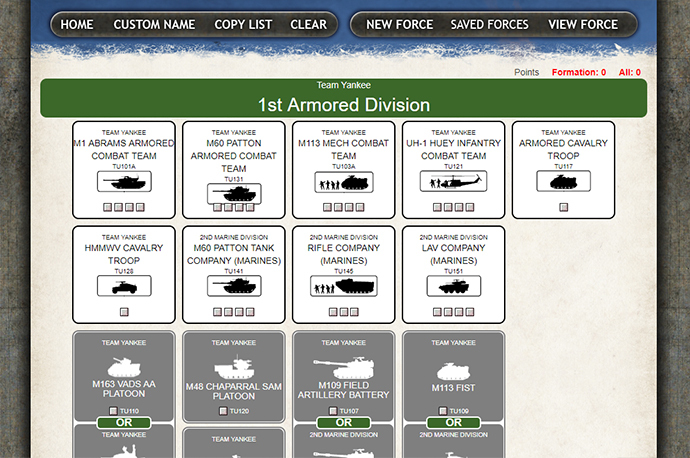 Not only does it include a breakdown on which platoons are in Formations vs Forces but it also has the information as to which Team Yankee Unit Card you will want to grab so you have all of the units in game statistics. 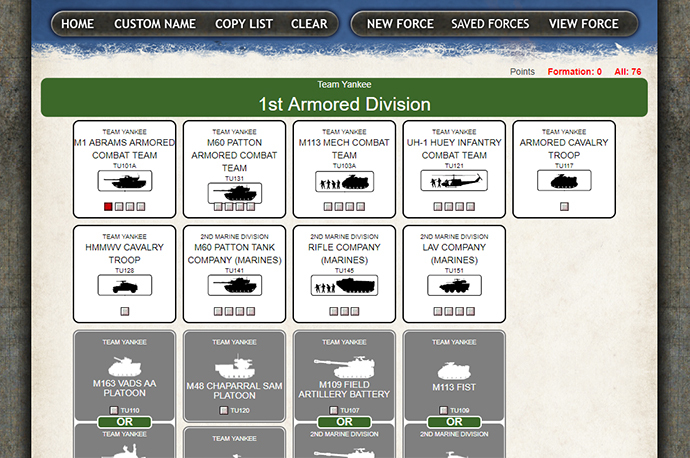 We've also added two Free lists with Bannon's Boys and Potecknov's Bears so you can see how it works and give it a try before you buy!